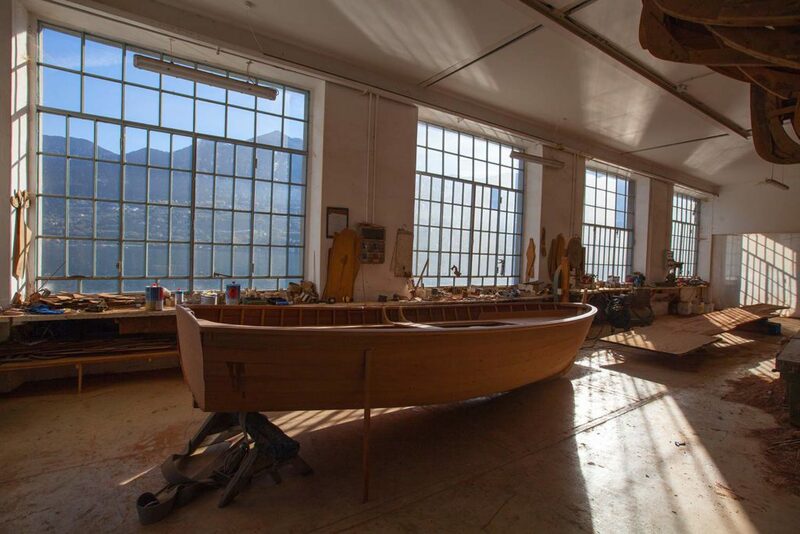 It is said that the “Naèt” was created in a boat yard on Monte Isola a long time ago. Its long and narrow shape closely recalls the famous Venitian “gondola”. Some elderly people from the island tell stories about a person called Archetti who had escaped from a Venitian prison and then took shelter on Monte Isola and invented the “Naèt”. This boat was very useful for fishermen because it was light, agile and quick. of the boat yards called Archetti. Working tools were, and still are, very simple: hammer, chisel, axe and plane. 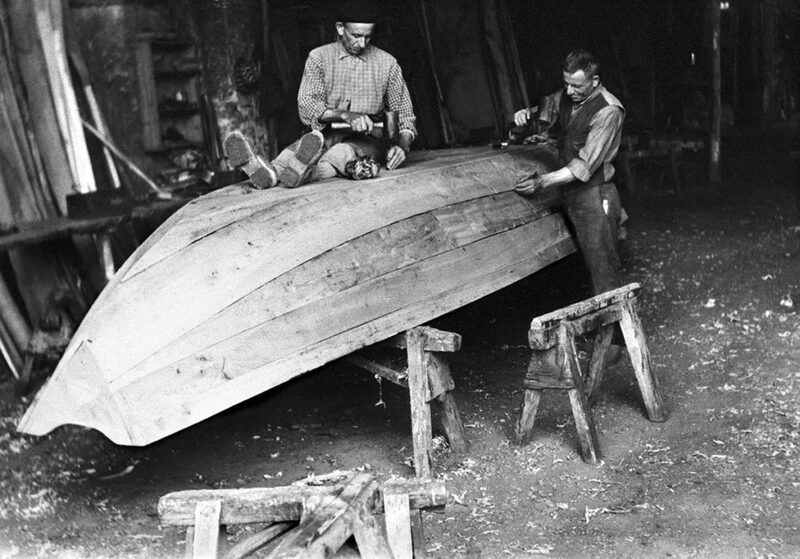 The types of wood used were, and still are, chestnut wood for the frame and larch for the other parts of the boat. engine, it was reduced to 6.40 metres; the width is 1.40 metres whereas the bottom of the boat, in its central point, is 80cm wide. Before the introduction of the engine a sail could be attached to the “Naèt” by simply adding two hestnut, crossed poles, one 3.5 metres high and the other 4 metres high, xtending the socalled “Pertega” (rod). Agriculture, given the natural conformation (which makes it difficult to process the land), has never played an important role in the economy of the Municipality, even if today there are many small olive plantations, which allow the inhabitants to produce local oil, not only for private consumption, but also for sale. Since 2015 the Municipality of Monte Isola has joined the National Association of Oil Town. For centuries Peschiera, Carzano and Sensole have been characterized by an interesting tradition: fish drying and preservation. The types of fish that are left to dry in the sun and then preserved in oil are sardines, chubs and perches. The technique in use is as follows: the freshly caught fish is cleaned with a single cut under the head (sardine) or opened and the head is cut off (chub). The fish is then cleaned, dried and left 24 hours in salt, according to its weight. The salt is then removed and the fish is washed again and hung onto some hooks fixed to a special framework, in parallel rows. Some fishermen thoroughly respect the tradition by threading the fish onto the stretched cords of the “archetti” (ash and hornbeam branches bent in the shape of an arch and kept in position by a cord). Walking along the lakeside between Peschiera and Sensole it is still possible to see many of these arches. The fish are left in the sun for 5 or 10 days, according to the climate, and then skilfully put in iron containers, pressed and separated from the air with a layer of oil. After a few months’ seasoning sardines turn gold and chubs turn lobster pink: you can then barbecue them for a few minutes and serve them with an oil, parsley and garlic dressing, accompanied by “polenta”. It is said that this dish, characterized by a strong and special taste, dates back to about a thousand years ago when fishermen were forced to give a certain amount of dried sardines to the Convent of Santa Giulia in Brescia. This kind of fish in oil lasts about a year: that is why it has always been considered the poor’s dish, a brilliant invention of fishermen who could only catch big amounts of fish in certain times of the year and were therefore forced to preserve it without a fridge. Up until few years ago it was impossible to enter a house in Monte Isola without finding a fishing net. The manufacturing of nets requires long and meticulous work: it is necessary to study the size of the meshes (length and width) since the quantity and quality of the haul depends exclusively on the net itself. 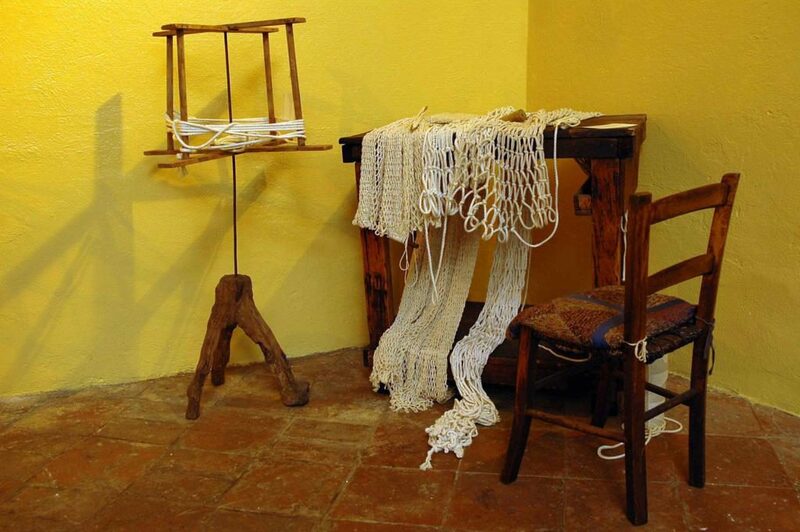 According to the tradition, the first net manufacturers were the Cluniacs from the Islet of Pan Paolo, from whom fishermen learnt to intertwine willow branches and silk yarn. In far-off times nets were the cause of many disputes between poor and rich fishermen, because the ones made by rich fishermen, who could use a stronger material with no sparing of yarn, could be immersed in deep waters and were therefore able to catch fish before the ones made by poor fishermen, who only had small nets near the lakeside. 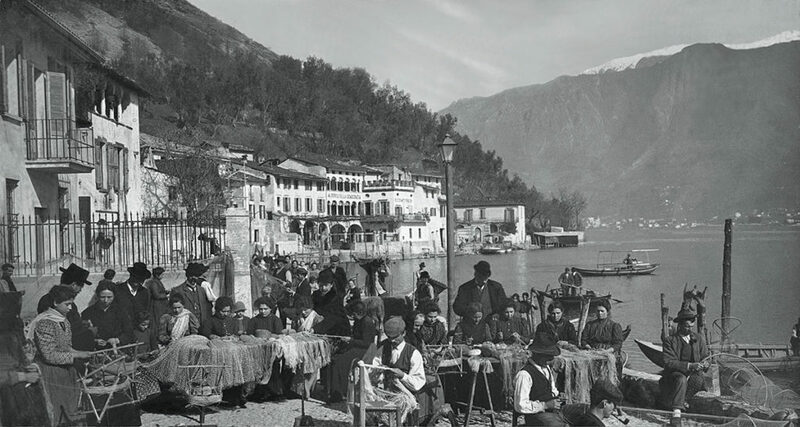 Disputes among fishermen carried on for many years, as the ones in Monte Isola claimed the right of fishing all over the lake, whereas the Pisogne people wanted to set boundaries. These disputes turned into real fights, with the use of weapons and net and boat thefts, which ruined many families on the island, since net manufacturing involved the work of a whole family through winter time. During the 15th century the great humanistic courts bought their hunting nets on the island. In the 18th century the income deriving from net manufacturing was higher than the income produced by fishing. In 1857 the island’s first “retificio” (net manufacturing company), the “Retificio Mazzucchelli”, was created and had 70 workers. Thanks to the great demand the island’s net manufacturers moved to Brescia where, in a few years, they opened five workshops. Industrialization and competition from Asian countries caused a sudden downturn in production, however this activity has been recently picking up thanks to some family-owned, craft businesses which produce not only fishing and hunting nets, but also sports nets exported all over the world: for example the nets used during the last Football World Cup were produced on Monte Isola. In Cure, Masse, Olzano and Senzanofishing traditions are replaced by the salami tradition. Between December and February, all families have always killed their pigs, either bred or bought, in order to prepare home-made salami. Even local people who have migrated still carry out this winter tradition. 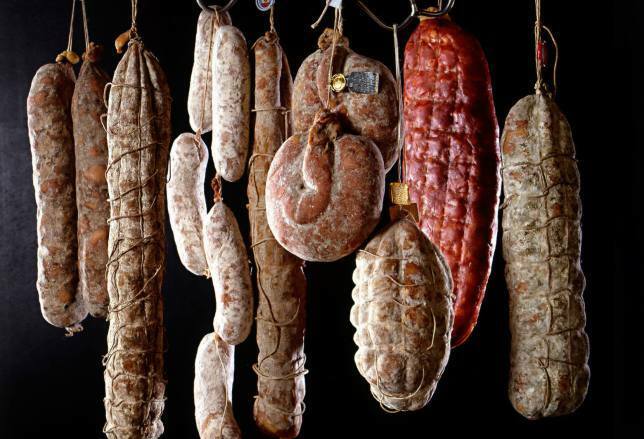 In the homes of Cure, Masse, Olzano and Senzano a few “experts” organize the long and patient processing of home-made salamif, in scrupulous obedience of the ritual which has been passed down for generations unchanged. the meat by hand in thick pieces (electrical tools are strictly forbidden! ), blending the mixture, making it into “sausages” and tying them. By tradition, menstruated women could not take part in this process, the moon had to be waning or, if the moon was waxing, it had to be done on a Friday. During the second stage (smoking), salamis are hung in a special room, the so-called “cà del salam” (salami house): an old cellar with non-plastered, stone walls, vault ceiling and a fireplace in which it is necessary to keep burning dry wood in order to keep an even temperature. The fireplace must be closed so that the smoke can spread into the room in order to smoke the salami and keep the temperature warm, especially in winter time. There are few rooms on the island with the right features: it is therefore necessary to make do with the only ones available and book them in advance (usually in the same room you will find salamis coming from four or five different pigs). The salami is then left to hang for 30 days; you can then eat it or hang it in normal cellars or put it in terracotta vases (“òle”, once made of stone) in fat. 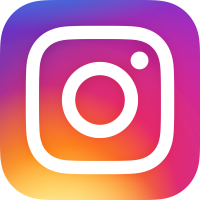 This process as well is carried out according to a special technique. According to the islanders, the same procedure carried out outside the island does not give the same results.